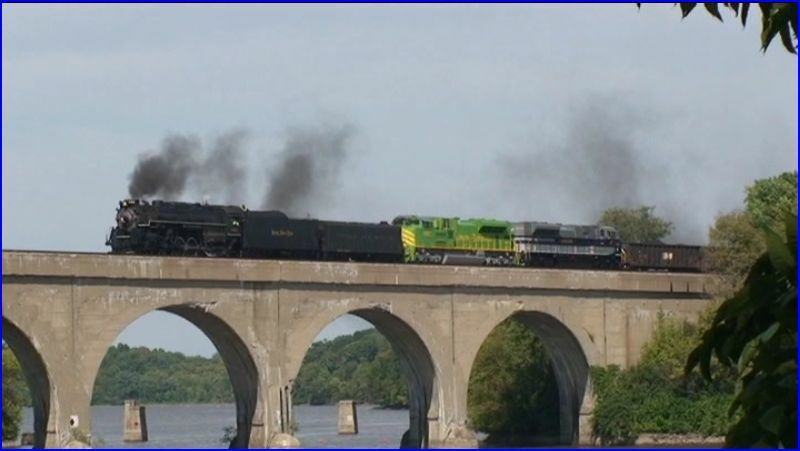 Locations: Fort Wayne to St. Louis excursion..
Mainline steam has become a bit of a rarity. 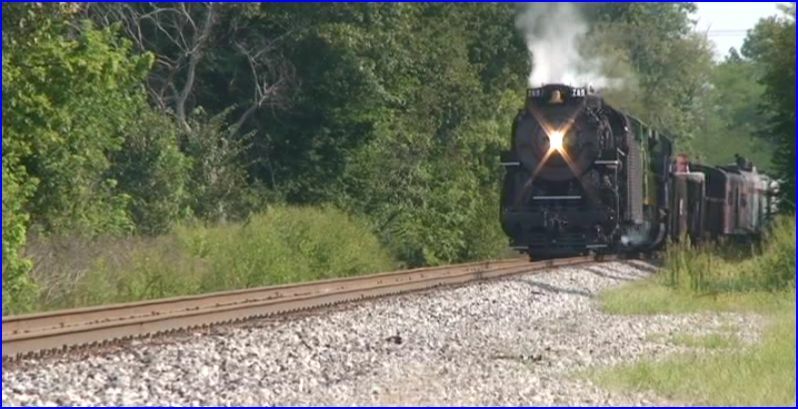 Norfolk Southern has 21st Steam as this railroad’s steam program. 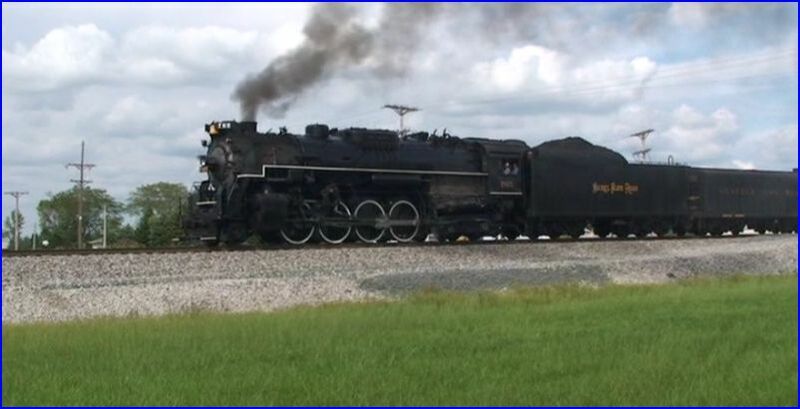 Needing additional steam power, Nickel Plate Road #765 was the active steamer chosen by NS. 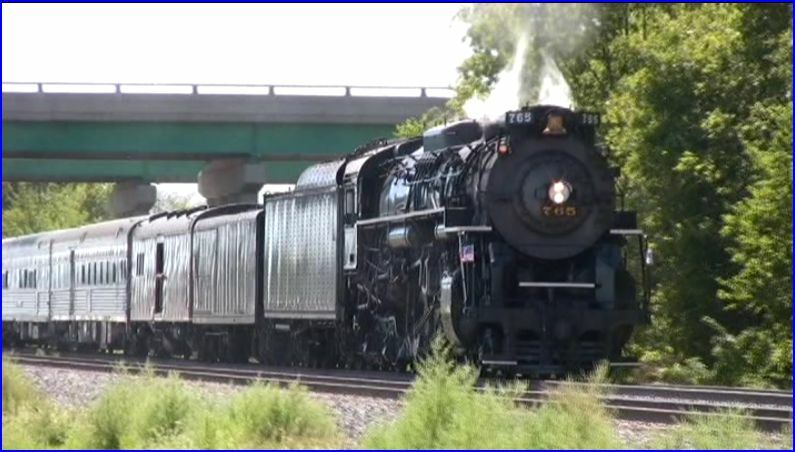 The #765 is the Northern States representative for 2012 specials. 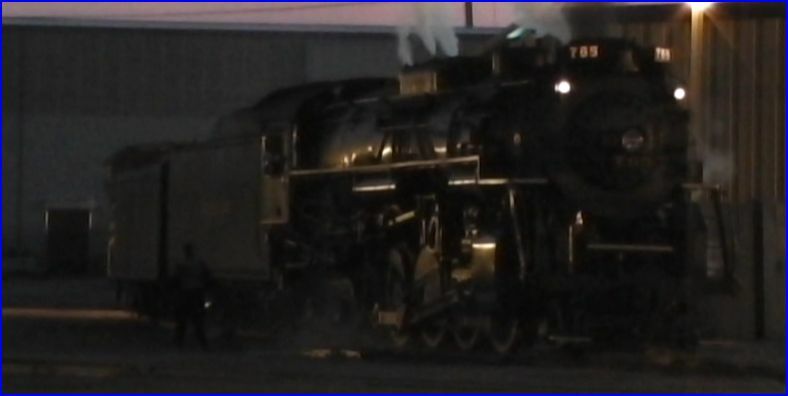 Southern #630 represents the Southern States. A section is filled with still photos and history of the steam program. Southern 4501 is another participant, though currently out of service. Historical aspects and resurrection of the NS steam program are discussed. A little in house contemporary DCP video footage rounds out the history. Our story begins in New Haven, Indiana at the Fort Wayne Historical Society. It is September, 2012 . The video looks sharp! Lively, environmental audio too. Diesel assist seems to be the standard operating practice nowadays. Two very stylish diesel locomotives have the honors on this excursion. Heritage schemes for Illinois Terminal and Wabash look great! 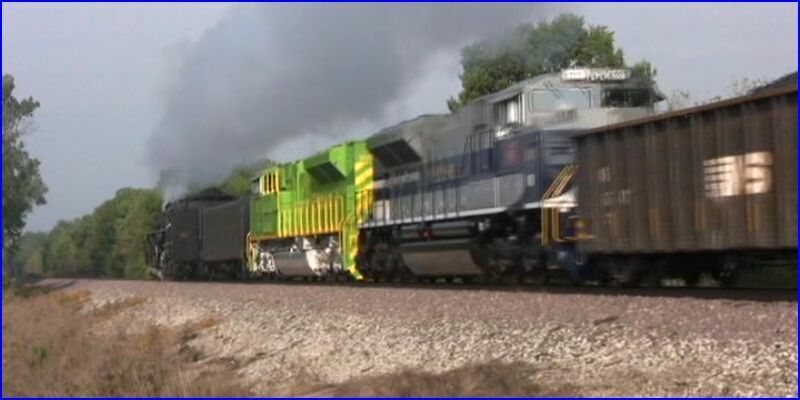 Diverging Clear has this newly released train video of the 765 on a few moves in 2012. The centerpiece is an employee special from Ft. Wayne to St. Louis. A detailed chapter menu breaks it down. The previews are the extras. 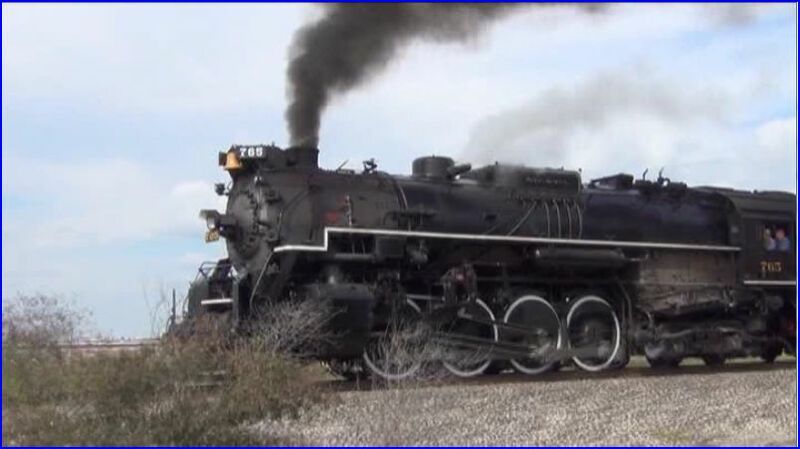 One wonders if any old steamers work much at all anymore, with all that state of the art horsepower trailing in modern combined lash-ups. An inside source informs that, the 765 is doing 100% of the pulling. The train will travel on former Wabash trackage. A basic map on the DVD case shows Decatur, Illinois as a point along the route. Final destination will be St. Louis. On- screen graphics label the multitude of one horse towns. Plenty of farms and crops are present. A smooth pacing sequence of the engine is a show highlight. Modern camera equipment does look mighty fine. In fact, Diverging Clear is constantly upgrading their field and post production gear. The results are excellent. Audio is a combination of natural sound and a narrative. After viewing many of their shows, the overall soundtrack quality, is noticeably improved. This program has the complete trip of the excursion. One of their best contemporary steam shows from Diverging Clear. Kurt Jensen is the narrative host. Nicely performed. Oh, he sings too! The special is chased as it traverses the line. Scenic bridge crossing into Decatur. Overnight stay will be in this town. The following day, the 765 is sporting a replacement steam whistle. The lower toned Steamboat type. Which one is better? You will have to decide for yourself! Passenger cars are lettered for Mid America. Background information would have been a helpful addition to the program. 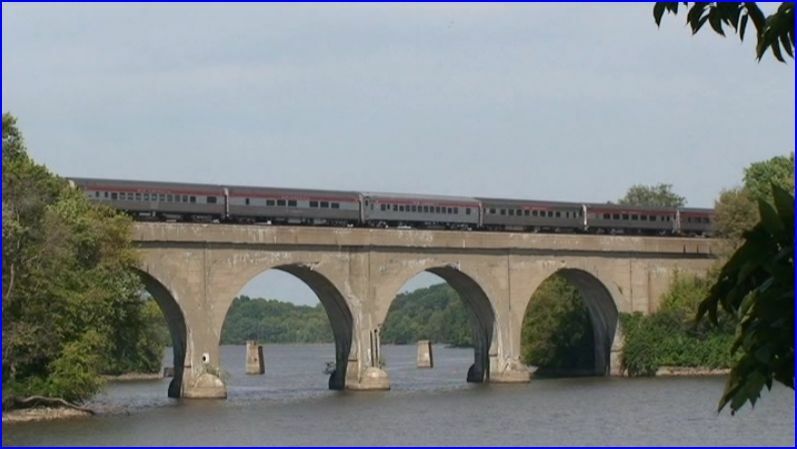 Some historical discussion on some of the cars, or the Wabash line itself, would break some of the monotony of the rural runbys. The shots are there, but some variation in the narrative is needed to better balance the overall presentation. The deadhead return move to Fort Wayne, sans diesel assist. 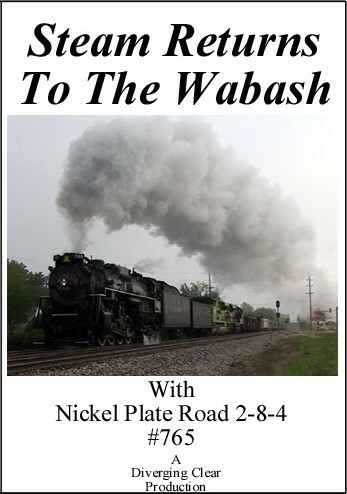 Steam Returns To The Wabash, is a good looking and sounding show. 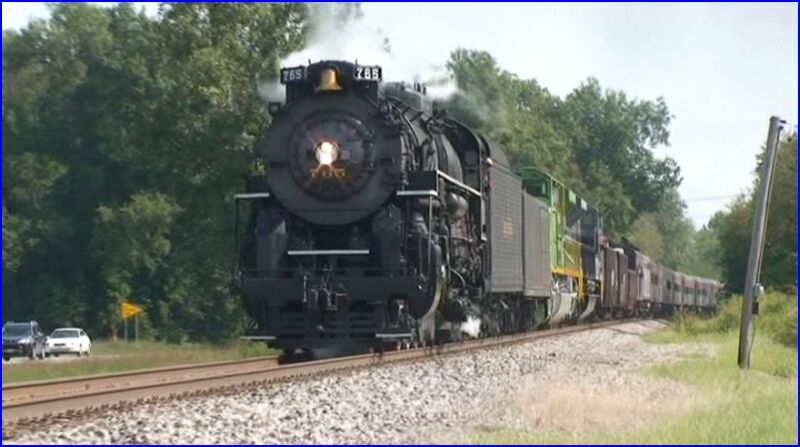 Fans of Nickel Plate Road 765, and modern steam excursion folks will enjoy this program. 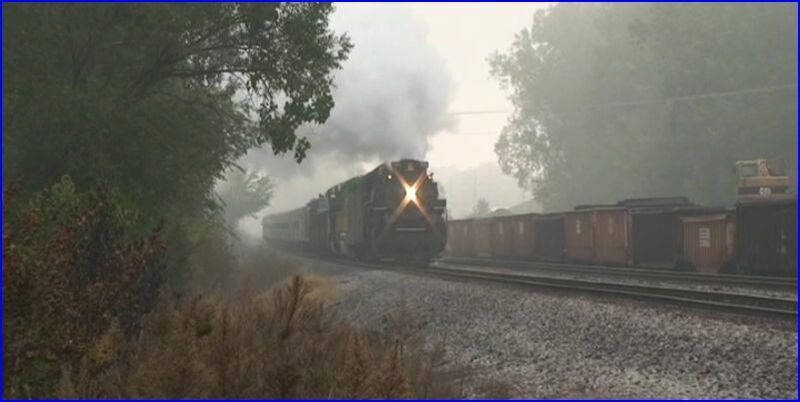 This entry was posted in ATVR Reviews, Diverging Clear Productions, Steam Train Reviews and tagged American Train Video Reviews, new releases, Norfolk Southern, Railroad, steam train, Train DVD by William J. Hudson. Bookmark the permalink.